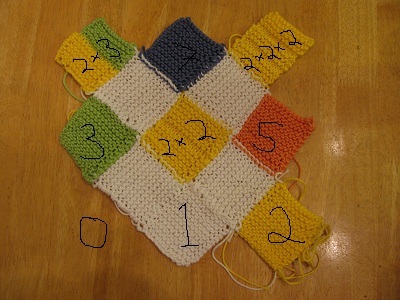 Sonderbooks » Blog Archive » Swatching a Prime Factorization Blanket! Swatching a Prime Factorization Blanket! I’m excited! My little brother Robert’s wife is having a baby. Since Robert is even more mathematically minded than I am, if that’s possible, I definitely think his baby needs a prime factorization blanket. I had to laugh, though, because when I told him this instead of expressing gratitude, he said, “Okay, but we’ll have to talk about the representation of 0 and 1.” I remembered that a long time ago when I showed him my prime factorization sweater, he told me that he thought the rows should start with 0, 10, 20, and so on. Now, I don’t want to include 0. Primes and composite numbers are properties of the natural numbers. But then I had a brilliant idea: Why not leave a hole for zero? Now to figure out how to work that in. Mind you, I wasn’t prepared to make another grid like my original sweater. I wanted to do something different, and I didn’t want to have to have several colors dangling as I knitted each row. I also didn’t want to use stripes like my prime factorization scarf or the prime factorization cardigan I’m working on. To make a wide enough blanket, that would take far too much yarn. That’s what gave me the idea of using entrelac, that and a brand new book I’d had sitting in my house for a few months called Entrée to Entrelac, by Gwen Bortner. I planned to use Cotton Classic, the same yarn I used for my original sweater, because I can use the leftover colors from that sweater for a lot of the larger value factors, so I won’t have to buy that much additional yarn. On yarn.com they had a sale on Cotton Classic, but no off-white, so I’ll go with a white background, which is nice for a baby blanket (though it won’t stay clean — but that’s their problem, teehee). Of course, that’s what I thought, but the total (for some additional colors) was a lot more than I’d usually spend on a baby gift, but I’m going to have so much fun with it, it’s totally worth it. I decided the easiest way to break a block into factors would be to have 12 stitches and 24 rows. 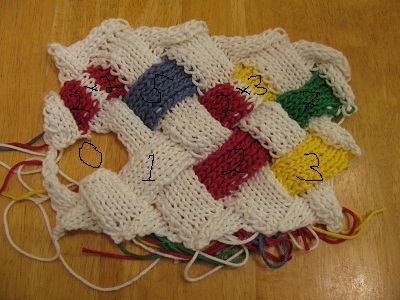 (Entrelac normally has twice as many rows as stitches.) This would divide naturally for 2, 3, 4, or 6 factors, and I can work something out for 5 factors. What I did like about this swatch was using a ridge instead of a band of white between factors. Much easier and will involve less ends to sew in. The yarn was softer, but it would make a much bigger blanket, and I thought I’d rather use the cotton after all. I decided the outside white rectangles were completely unnecessary. The biggest thing I didn’t like was that the edges were curling way too much. So the kind of obvious solution for curling edges? Use garter stitch instead of stockinette. A bonus is that then it will be easy to count ridges to divide up a block. I’m very happy with everything in the last swatch (this time base 3) except the particular choice of colors. (I hate that orange! And the green shade didn’t turn out very lovable.) Instead of a ridge where there are factors, I’ve got the lack of a ridge. I think this might work! I should mention that the actual blanket will be rows of 10, but I wanted to work out the overall scheme with less. The most lovely thing about doing the blanket in entrelac instead of intarsia, like I did the original sweater, is that I can knit one number at a time, and I can do it in order! So I don’t even have to plan it all out ahead of time, I can just jump in and knit! So — I will be knitting the rectangle for 1, and once I finish that, I will have to make a decision about the color to use for 2. Will I find out the baby’s gender before I begin? Either way, it’s going to be a unique and beautiful blanket, if I do say so myself. 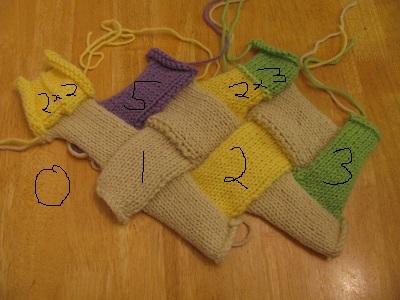 This entry was posted on Tuesday, December 4th, 2012 at 10:34 pm and is filed under Knitting, Prime Factorization. You can follow any responses to this entry through the RSS 2.0 feed. You can leave a response, or trackback from your own site.